Now when you test using Overdrive, maintaining your security has just gotten a little easier. Click the Security Heading and see individual tabs for [Results] [Tracking Cookies] and [BHOs/Toolbars]. After clicking the [Tracking Cookies] tab, you will see cookie removal instructions for IE6, IE7, and Firefox are included. 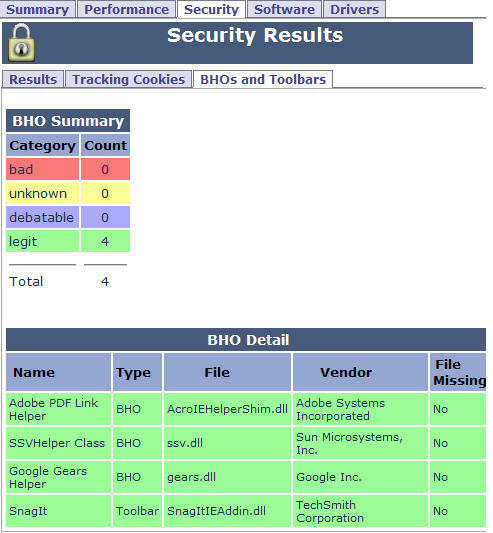 Click the [BHO and Toolbar] tab and all are identified to help prevent attack from unwanted intruders. While many BHOs add needed functionality to your Internet Explorer browser, others can be unwanted and a waste of system resources. Thereâ€™s no need for guessing anymore. OverDrive distinguishes the good from the bad with just a glance at the color coded identification. Just click the Installed Software heading to view a complete list of what’s installed on your computer and when it was installed. Not only does Overdrive show what software is installed, but it shows a list of suggested Microsoft Hot Fixes. Just click the [Hot Fixes] tab to view the suggestions and use the link to the correct Microsoft Help and Support page. By now most of us are aware of how processes running in the background can eat up system performance and slow our computers to a crawl. These processes are also color coded showing which are required for the proper Windows functioning and which are optional, virus, or should be disabled. Always looking for ways to give you the most useful information available, Overdrive now shows which processes are using the most CPU cycles and which are using the most systems memory. For the first time, Overdrive allows you to see not only whatâ€™s running, but how much of your resources are being used for each process. Just click on the Software heading and then the [Utilization] tab. There is no better software available for testing your system. PC Pitstop has designed and improved Overdrive to keep pace with the increasing sophistication of today’s computing. Don’t be in the dark anymore. Know what’s taking place on your computer and take control of its performance in less than 2 minutes. The Pit Blog computer, functionality, hot fixes, internet explorer browser, microsoft help, OverDrive, PC Pitstop, software, tab, unwanted intruders. permalink. I have tried 3 times to scan my system with Overdrive and my computer freezes, even keyboard and mouse when I get to the 3D part. I have to shut down and restart in safe mode. Any suggestions? Down Load Glary Utilities it free and is as good as any registery cleaner I have found. I have tried to run the overdrive test. get all the way to 3D and IE pops up with 3D Video box and cannot finish test. can I go aroung this. Have tried all I know to resolve problem. Do I need a new 3D card. Please help as I need test results for job requirements. Thank you and have gday. Can someone that uses reg card reg cleaner,and what do you think.I want to get some. could you please explain ?!?! p.s. how can i reg an accout with you ? Hi been using your excellent service for years now and I must say “its the best on the net”. However using the New and Improved version I get this error “Latency test returned an error while trying to read the latency file”. Should I delete the program and start again? I like the new format and it’s much easier to navigate the results. All the pertinent information is still there but much easier to look and compare. The information displayed makes much more sense without having to go back and forth through all the different web pages that you used to have to do in order to look at and compare results. Thanks for a fantastic job, and although my display drivers weren’t out of date, my Marvell/Yukon gigabit ethernet driver was out of date. I went to the manufacturers website and found my correct driver and updated without a hitch. For the guy who updated his nvidia display driver, ever heard of safe mode, remove all instances of the old driver FIRST, then install the new drivers? There’s a generic set of display drivers loaded when you uninstall ALL instances of the old Nvidia driver prior to installing the new display driver so if you had a black screen, just boot into safe mode and use the default generic driver to access your O/S and run setup for the new Nvidia display drivers. You should ALWAYS keep your hardware drivers updated as the manufacturer builds them. They tend to give old hardware new abilities or make them more efficient. Read the “read me’s” and follow all instructions to avoid problems in the future. Read up on trouble shooting and installation problems and the fixes other’s have found like all the rest of us techies out here do. Having just run the scan and taken the advice to update my nvidia driver set, I now have a blank screen at boot up and non-functioning PC. Thanks! It seems the old drivers were removed, but no replaced. The lesson for me is NOT to update drivers (just for the sake of it) unless there is an obvious problem; whatever PC Pitstop may recommend.